A member of the exempt group. If you are registering as an annual premium paying member, please note that you will pay premium and processing fee once every year for renewal. A pregnant woman will have to present proof of pregnancy such as current antenatal card, a signed note from a doctor or midwife, pregnancy test result endorsed by a doctor or midwife or other prescriber or an ultrasound scan report. A SSNIT contributor should be active in the SSNIT database presented to NHIA by SSNIT. A SSNIT pensioner should show his/her SSNIT number. ou will be registered without paying premium. You will be required to renew your membership every year. After taking your personal particulars and payments, the registration officer will take your photograph and biometric information. During the taking of your photograph, you should open your eyes and look straight into the camera. You should also close your mouth. During registration, you will be required to select your preferred primary provider (PPP). The PPP should be a primary care provider, which should either be a clinic/health centre, polyclinic or a primary hospital. You should make the choice yourself otherwise you will be assigned to an available primary care provider. When you fall ill, you should first of all visit your PPP for treatment. If your illness cannot be treated at the primary care level, you will be referred to a higher level health care facility. In an emergency, you may access health care at any health care facility. You may change your PPP at determined intervals or when you change your permanent residence. After registration, the district office will give you a list of health care facilities within your area operating under the NHIS. 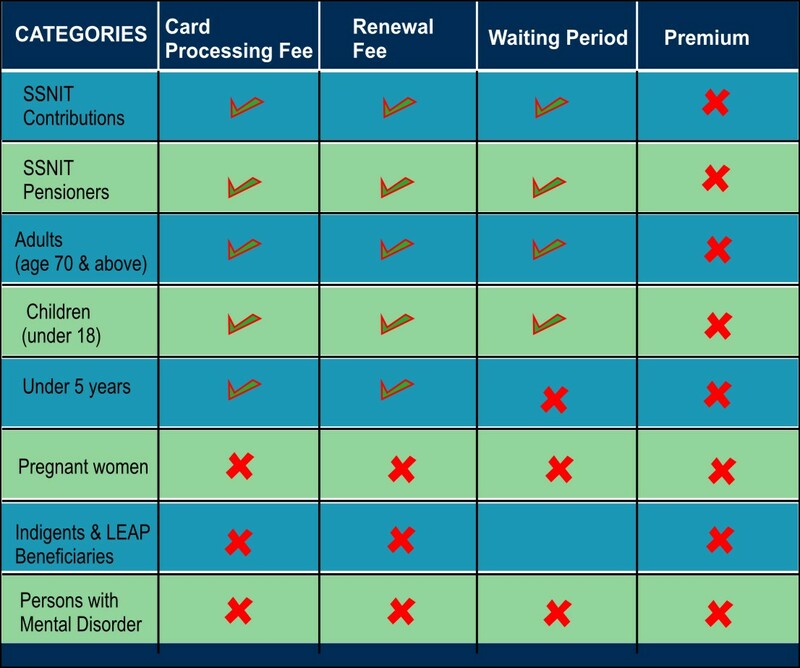 Go to your selected Preferred Primary Provider (PPP) with your card. Present your card to the person in charge at the out-patient department or front desk of the health facility. Officials of the health care facility will check the validity of the card and your biometric information. Following a confirmation of the validity and your details you will be attended to. Do not leave your card at the health facility after accessing health care. Contact the district office or NHIS agent in your community. Fill a replacement form and pay the processing fee where applicable. Your membership of the NHIS makes you a stakeholder of the scheme. You have a responsibility to pay your premium and/or processing fee promptly and ensure that you do nothing to undermine the scheme. Possess an NHIS card: As a subscriber, you are entitled to an NHIS card after completing registration. 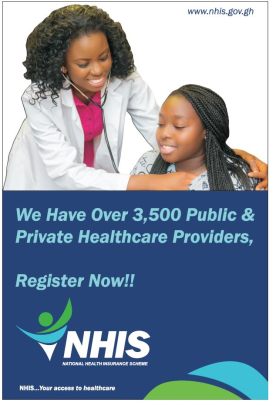 Access health care with your NHIS card: Apart from expectant mothers and children under 5 years, new subscribers serve a waiting period of three months after registration before they can access health care. Standard treatment at the district office and provider sites: District office and provider staff shall treat you with dignity and respect. You should not be discriminated against on the basis of ethnicity, gender, disability, marital status, social origin, nationality, religion or creed. Information from your district office and your health care provider: Your district office shall provide you with information on which credentialed health care facilities you can select as your PPP and when to renew your membership. Your health care provider shall provide you with information about your health condition and the medicines given you. The provider shall further explain to you every procedure done on you. Ask questions or seek clarifications at your district office and provider sites: You have the right to ask questions or seek clarifications. Quality health care: Standard medical care shall be given by qualified health care professionals in a safe and cordial environment. NHIS prescription: Where a medicine which is prescribed for you is not available at the hospital or clinic, you have the right to have it prescribed for you so that you collect from a credentialed pharmacy or chemical shop. At the pharmacy or chemical shop you will be asked to show your NHIS card and the prescription before being served. Renew your NHIS membership before it expires: You are expected to renew your NHIS membership once every year. You are advised to commence the renewal process one month before expiry. Members who fail to renew their membership three(3) months beyond the date of expiry shall have their membership deactivated in the NHIA membership database until they renew it. Defaulting members who renew their membership after three months of expiry will be required to observe a one(1) month waiting period before accessing health care under NHIS. You will be issued with a new NHIS ID card every five years: You are advised to commence the renewal process one month before expiry of the card. You will be required to present your old ID card at your district office for the reissue process. Do not seek health care with an expired card or expired membership: Do not seek health care on the NHIS when your membership or ID card is expired until you renew it. 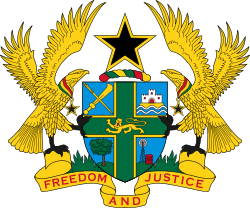 Do not give your ID card to another person to access health care: This is an offence which makes you liable to punishment under the laws of Ghana. Do not access health care with your ID card on behalf of another person or take medicines for another person: The health professional will not know the exact condition the other person has, and therefore the medicines given may be harmful to that person. Do not leave your ID card at the health care facility after receiving service: You should have your ID card with you at all times. You should therefore refuse any request to leave it at the facility. Do not engage in provider shopping: Do not move from one health care facility to another with the same ailment or other complaints when you have not completed a course of treatment. It is dangerous to your health. Observe the gatekeeper system: If you fall sick, you should first visit your preferred primary provider (PPP) for treatment. If necessary, you will be referred to a higher level health care facility. In emergency cases, however, you may access health care at any facility. If you access health care at a health care facility that is not credentialed by the NHIA, you will be responsible for the payment of the bill. Medicines that are not available at the hospital or clinic but are on the NHIS Medicines List can be obtained from a credentialed private pharmacy or chemical seller. Report any suspected illegal monies collected from you to the district office or the NHIS Call Centre on 054 444 6447/0302 74 6447. MTN and Vodafone subscribers may call short code 6447. Know the benefits package: You have a responsibility to know the services you are entitled to under the NHIS. A medicine prescription which you do not require or which is more than what you require. Indulges in any other fraudulent or dishonest act, commits an offence punishable under the law. What is the National Health Insurance Scheme ? The National Health Insurance Scheme (NHIS) was established under Act 650 of 2003 by the Government of Ghana to provide basic healthcare services to persons resident in the country through mutual and private health insurance schemes. The District Mutual, Private Mutual and Private Commercial Schemes are regulated by the National Health Insurance Authority (NHIA). 2. 2½% National Health Insurance Levy. 3. 2½% Social Security and National Insurance Trust (SSNIT), deductions from the formal sector. 4. Funds from Government of Ghana (GoG) to be allocated by Parliament. Where can one register with the NHIS? Are children covered under the NHIS ? 1. Children less than 18 years of age whose parents or guardians are contributors are not required to pay premiums. 2. Children in this category have to register to obtain coverage. 1. Full time students over 18 years are required to pay the minimum premium of ¢72,000 to enjoy benefits. 2. Those who are neither in Tertiary institutions nor are contributors to Social Security are registered in the informal sector. Are the elderly covered under the NHIS? Yes. Residents 70 years and over are exempted from payment of contribution. People in this category should register to enjoy NHIS benefits. Are the Very Poor (Indigent) covered under NHIS ? Does not have any visible source of income. Does not have a fixed place of residence. Does not live with a person who is employed and has a fixed place of residence. Does not have a consistent source of support from another person. Are there special arrangements for contributors in polygamous household ? The husband and all the wives in a polygamous household have to be covered by NHIS for their children to be registered. No limit of children per couple. If I am single, can my children benefit from my contributions ? Yes, as long as there is a proof of divorce or community testimony of single parenthood status. Are legal dependants covered ? Yes, however a dependant who is not a child, a pensioner under the SSNIT Scheme, a person 70 years or above, or disabled should contribute to NHIS using rates set for the informal sector. What are the premiums set for SSNIT contributors and their families ? 1. SSNIT contributors are entitled to the minimum health care benefit without further contribution in premium. 2. A spouse of a SSNIT contributor who is not a SSNIT contributor must pay premium set for the informal sector.